Trundle beds have gained popularity in the last few years and are a great space saving addition to any home. They are offered in many styles and with a large assortment of finishes. Trundles in twin or full sizes have frames that allow them to be slid under a day bed, futon or regular bed when not in use. Because the trundle is close to the floor, it is excellent for toddlers and small children. The full frame which holds the mattress sits just a few inches from the floor on rollers. Trundles that sit on these wooden or metal frames pull out on frames that remain low. Children's safety rails fit these just like a regular bed if toddlers need the extra protection. Several trundle frames have a pop up feature and they can be raised to the height of a regular bed for older children or adults. This works so well because they can have the mattresses on and are made up with bedding, ready to sleep in. A light dust cover, such as an extra sheet, would keep the bed nice for guests. For instance in a guest room the the day bed, which provides seating space and an extra bed, has a trundle stored underneath. When the trundle is needed, it pulls out and is easily raised and clicked in place to the height of the day bed. These frames have locking mechanisms. The extra space saved may well provide a hobby area, extra corner for a card table for puzzles or games or any number of things in that room. A desk top that is on hinges and stores against the wall when the trundle is used makes perfect sense also. Wall shelves can hold office or hobby items up and out of the way quite nicely. 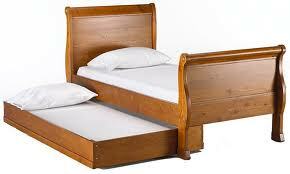 Standard bedding works fine for trundle beds because they are easy to access when pulled out for use. There is actually some good storage space on top of the trundle bed that some people like to take advantage of when the bed is not in use. 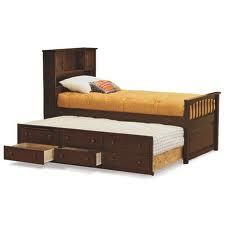 However, the real advantage of these beds is that they allow the saving of a lot of space. Extra space is a luxury in any room. The extra space can be utilized in many ways that the home owner, cabin owner or apartment dweller can enjoy. When shopping for a trundle keep in mind the style and color if you want it to match a bed you already have. 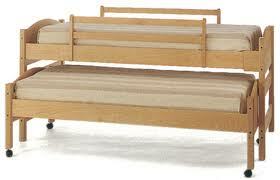 It is also a good idea to purchase a matching trundle when you buy a new bed. This way, the beds fit just right and look nice when they are both in use in the bedroom. Remember the home office too, The choices are many and really good for a multi-use room. Daybeds and futons are good as they provide seating and sleeping. Both easily acommodate a trundle. Futons with a bunkbed over and a trundle under are also awesome space savers. Make sure the beds are sturdy, that the mattresses will fit nicely on the beds without slipping or sliding and that the trundle made up with bedding will slide easily under the bed. Most manufacturers supply the dimensions of these beds and they are pretty standard but don't be afraid to measure them to insure the space they take when trundle is out from under the bed. Some are safety tested and bear a seal. They are manufactured in plastic, hardwood, metal and new materials as well, so enjoy! You will have a lot of different choices to pick from.